For the soup, heat a pot on medium and cook bacon until cooked, 4-6 minutes. Add the vegetables and cook for another 10 minutes or until slightly browned and tender. Add garlic and seasonings and cook until fragrant, about 1-2 minutes. Pour in wine, water, and clam juice and bring to a simmer. Add 2 tsp salt and simmer for about to 15 to 20 minutes to meld the flavors together. Add cod and cook for 5 to 8 minutes or until cod is cooked fully through. Be careful not to cook any longer than needed, as the cod will break up into very small pieces. To finish squeeze half a lemon into the soup and season with salt and pepper as needed. For the gremolata, combine orange zest, parsley and shallot together in a bowl. 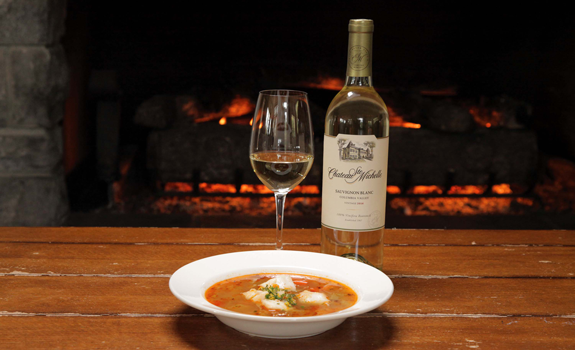 Garnish each soup bowl with a sprinkle of gremolata and enjoy with a glass of Chateau Ste. Michelle Sauvignon Blanc.